DEATH - the most prominent truth of our lives, has not been the core subject of many movies in the past for the obvious reasons, as the medium is more known for entertaining the viewers instead of spiritually enlightening them. However courageous, visionary and thoughtful filmmakers have repeatedly adapted the subject and made outstanding films capable of giving us much more than just three hours of entertainment, thankfully moving out of the norm and breaking the set pattern. One of the top most classics talking about the same is THE GREEN MILE directed by Frank Darabont, based on the novel of Stephen King. And the precious significance or worth of this creation can easily be judged by the statements of its original writer, director and lead star along with the other actors. 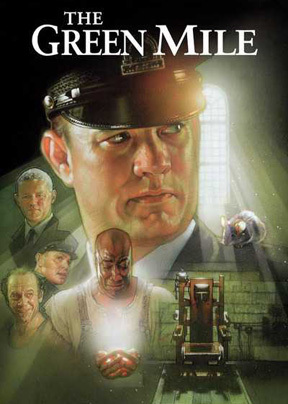 Reportedly author Stephen King called the film as ‘the single most faithful adaptation of his work till date’, director Frank Darabont called it ‘the most satisfying movie of his career’ and actor Tom Hanks said the film is about, ‘the great myths that communicate the complexities of being a human’, apart from other members of the cast still fondly remembering their personal experiences of working in it as a blessed opportunity given. A period film revolving around the Death Row guards at a prison/reformatory back in the 1930s, its about the moral dilemma faced by the officers on duty when they come to know about a special miraculous gift owned by a scary, dangerous convict who has been brought in to be killed as per the sentence given. As a film about crimes which were not committed; miracles which were not believed and relationships which were not planned, it’s a once in a decades kind of creation that would leave you speechless and unable to move for at least a few minutes post the end credits start rolling. It kept chasing me in a teasing manner for months after I viewed it for the first time and I still go back to it at times, to learn more from its situations, characters and their interactions written so beautifully. Its highly inspiring as well as heartbreaking narration makes a rock solid impact on the viewer, capable enough to change his or her thinking pattern and attitude towards life in more than one ways. Should not reveal anything else about the film as that would take away the magic of watching it unaware without any prior information of what’s going to happen next with all the relatable characters on screen. But would like to inform that this is a more than 3 hours long film and words are not enough to explain the positive and powerful impact it generates in these 180+ minutes to be very honest. It talks about Death - the only known truth of our life, in the most impressive manner that eventually forces you to think about your own, watching others die sitting on the chair with just a click of a button. In short, THE GREEN MILE is nothing short of a lifetime achievement made by its talented creative team and thus deserves to be seen at the earliest, even if you need to take a day off from the work postponing everything else. Believe me, you would not regret doing it at all, with no words to thank everyone on and behind the screen of this gifted creation. Starring : Tom Hanks, David Morse, Michael Clarke Duncan & more.